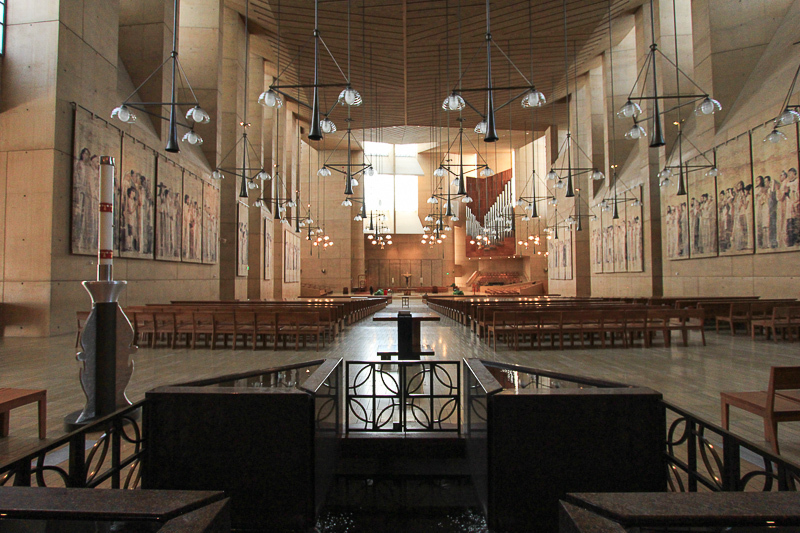 September 3, 2014 - Today's adventure was to tour the Cathedral of Our Lady of the Angels in Los Angeles. 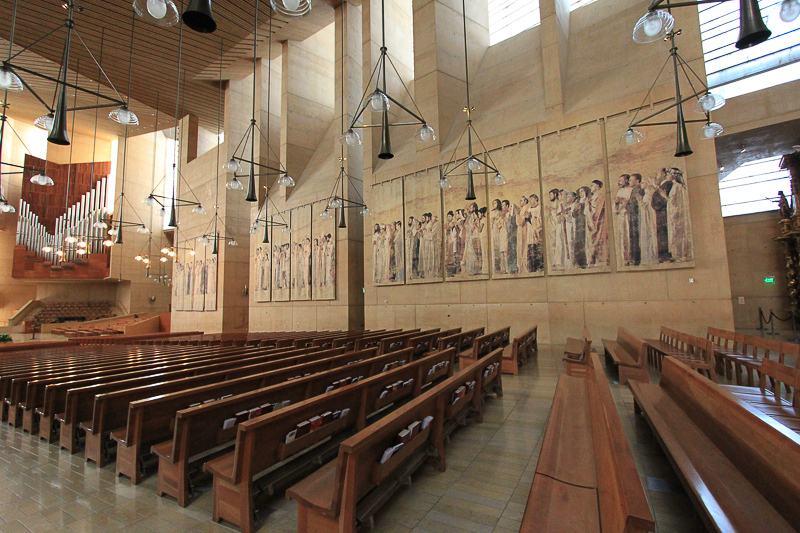 Opened in 2002, the Cathedral serves as the mother church for the Roman Catholic Archdiocese of Los Angeles. 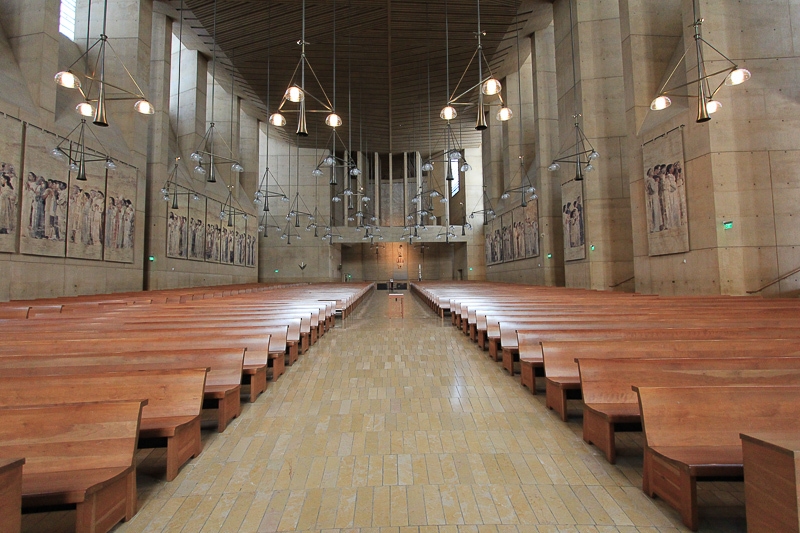 The Cathedral was designed by the Pritzker Prize-winning Spanish architect Rafael Moneo. 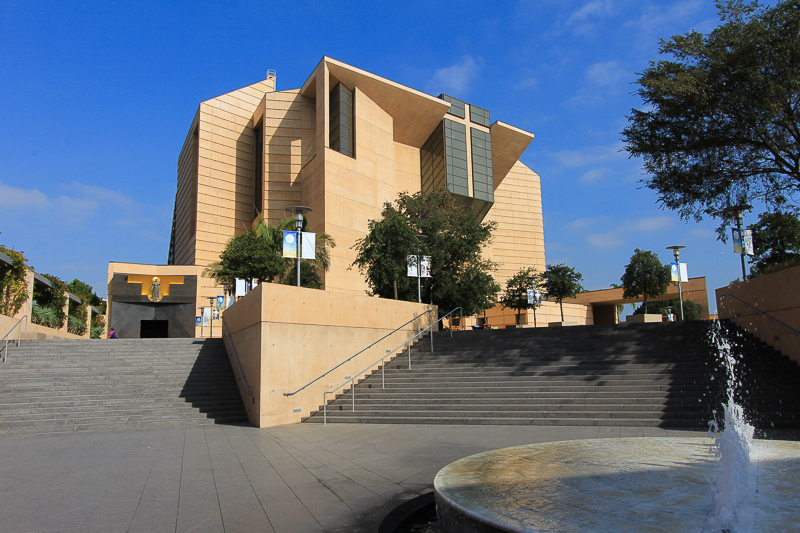 Using elements of postmodern architecture, the church and the Cathedral Center feature a series of acute and obtuse angles while avoiding right angles. 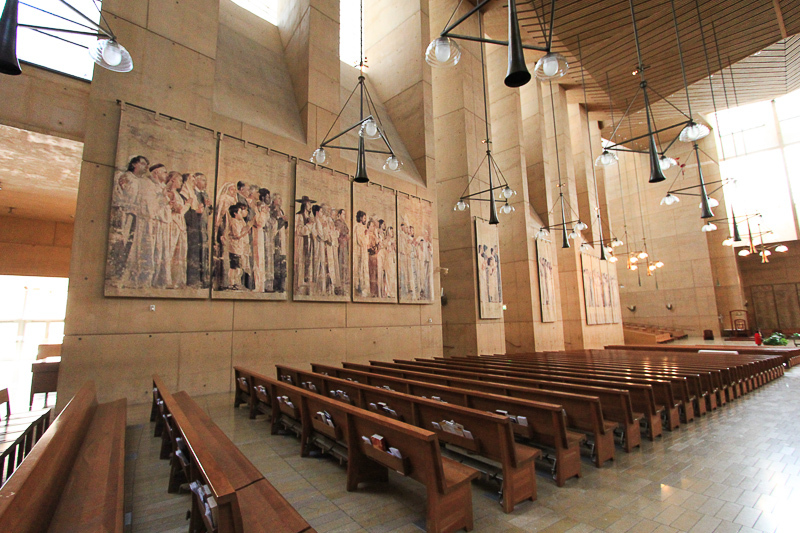 The Cathedral complex includes a large courtyard, parking lot, cafe, and shrine, covering a total of 58,000 square feet. The Cathedral itself is 333 feet long, which is purposely one foot longer than St. Patrick's Cathedral in New York, and rises to an internal height of 80 feet at the west end to about 100 feet at the east end, by the altar. 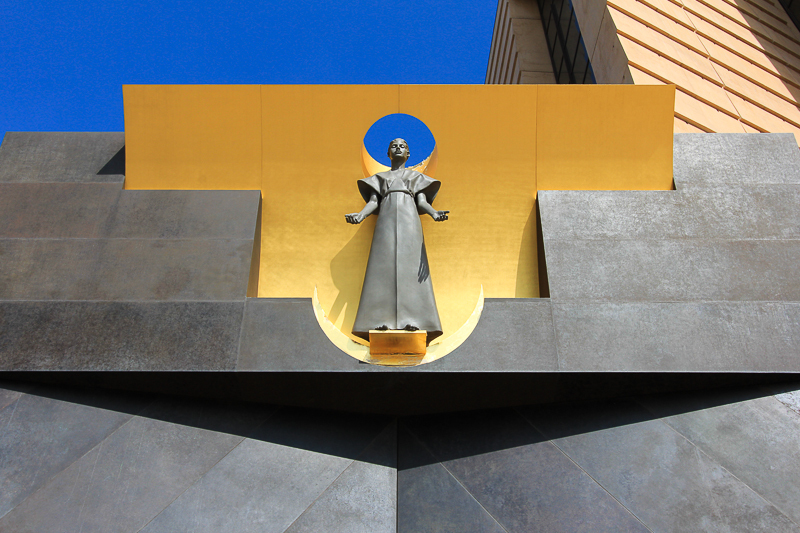 Natural light forms the halo around the welcoming Lady of the Angels. 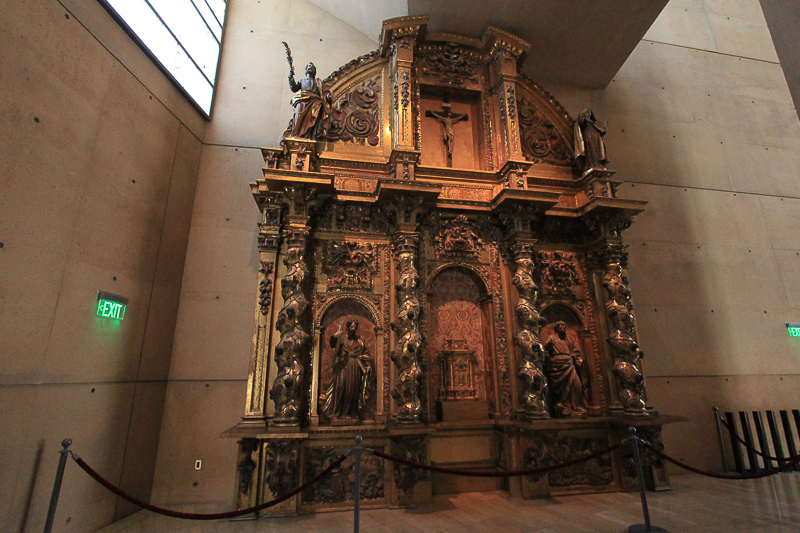 This Spanish Baroque retalbo (decorated panel) originally was erected in the Chapel of the Congregation of St. Philip Neri in Ezcaray, Spain in 1687. Seating can accommodate 2,500 to 3,000 people. The 60,000 Spanish Jana limestone paving stones have a circular pattern centered at the altar. The cotton and viscose tapestries were designed by John Nava and were digitally woven in Bruges, Belgium. 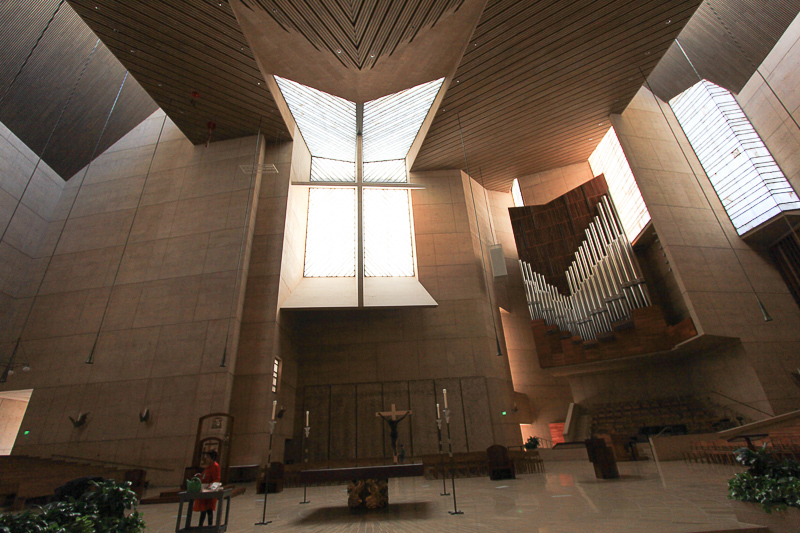 The windows illuminating the cross and the interior of the Cathedral are made of translucent alabaster. The sixty foot cross is illuminated from within at night and can be seen for miles. Little artificial light is needed. Fixtures suspended from the ceiling serve a dual purpose since the trumpet in the center of each contains a sound speaker. 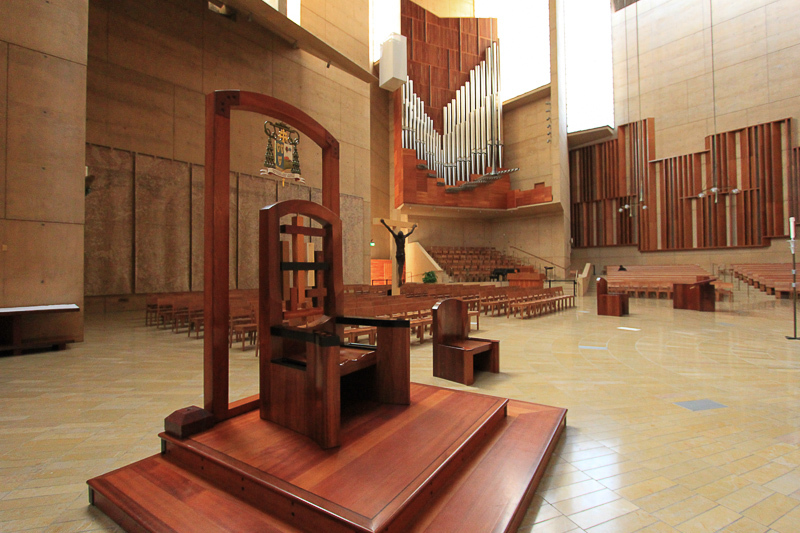 Every cathedral is so called from the word cathedra, Latin for chair. 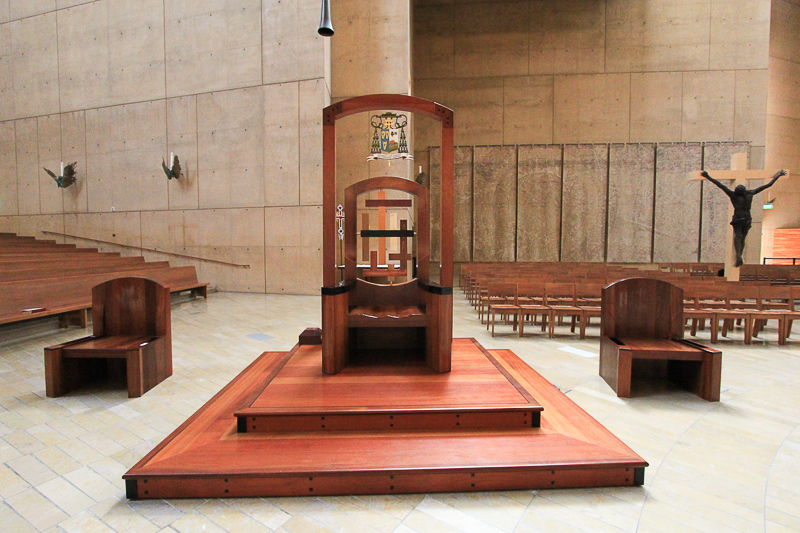 From this formal seat, the archbishop exercises his leadership responsibilities. It incorporates wood from ten different countries. The coat of arms above the cathedra belongs to the current archbishop. 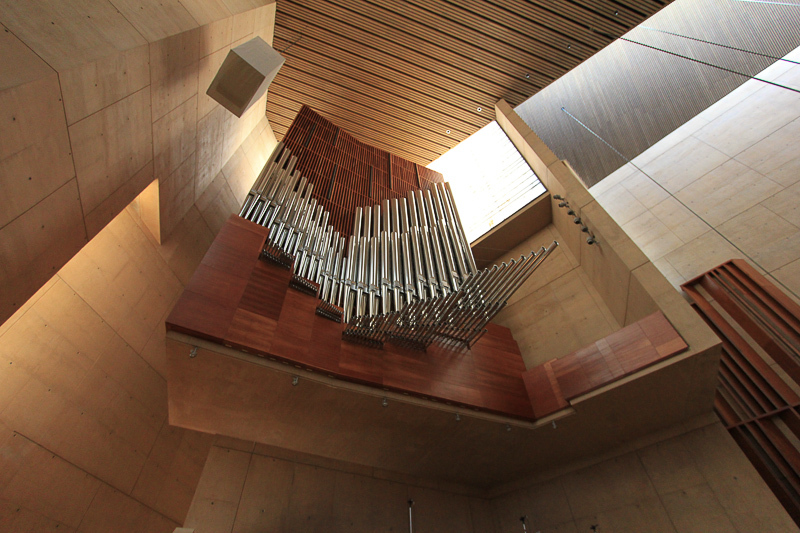 The Dobson pipe organ rises five stories high with its 6,019 metal and wooden pipes. 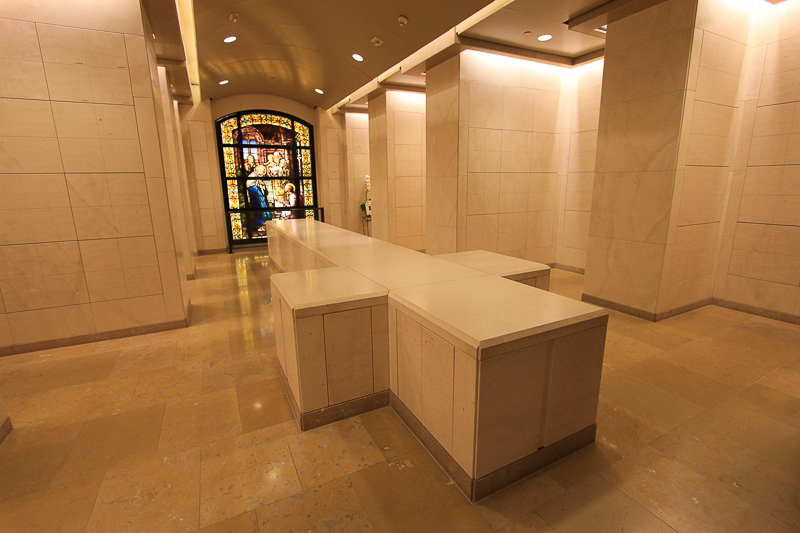 The Mausoleum lies beneath the Cathedral and has more than 1,200 crypts and nearly 5,000 cremation niches. 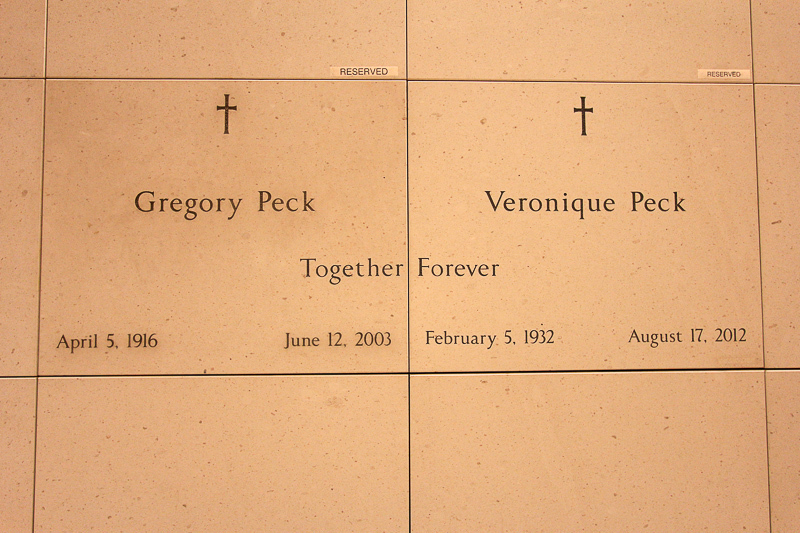 It is one of the few places in the United States where lay people can be buried within a Cathedral Church. 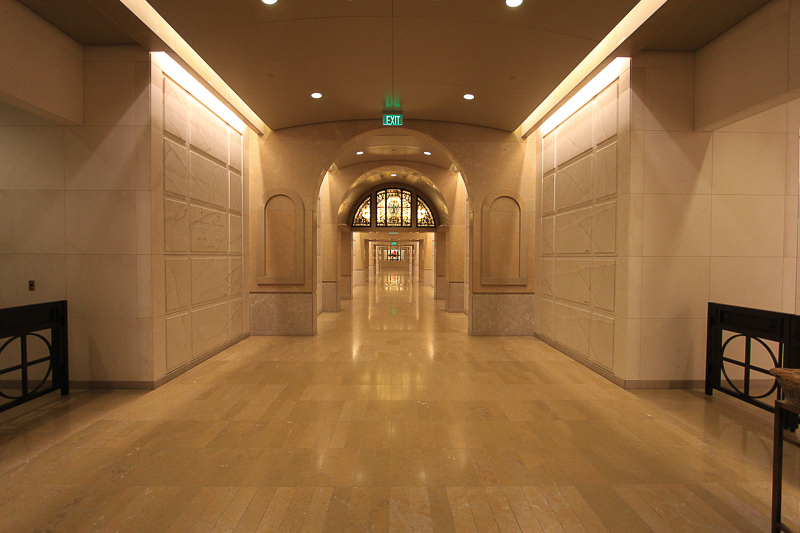 The Mausoleum has been crafted of Spanish limestone and is lit by the soft glow of alabaster sconces. 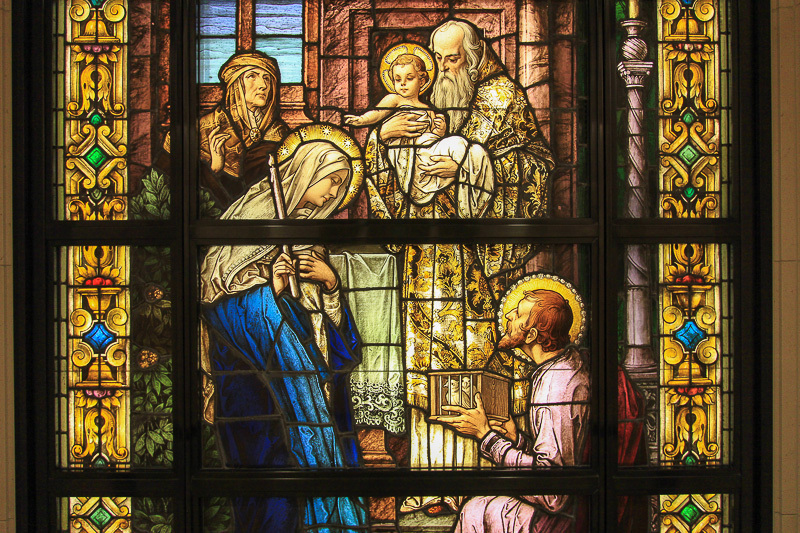 Sixteen of the historic stained glass windows from the old St. Vibiana's Cathedral, which this Cathedral replaced, have been restored and installed in the Mausoleum. 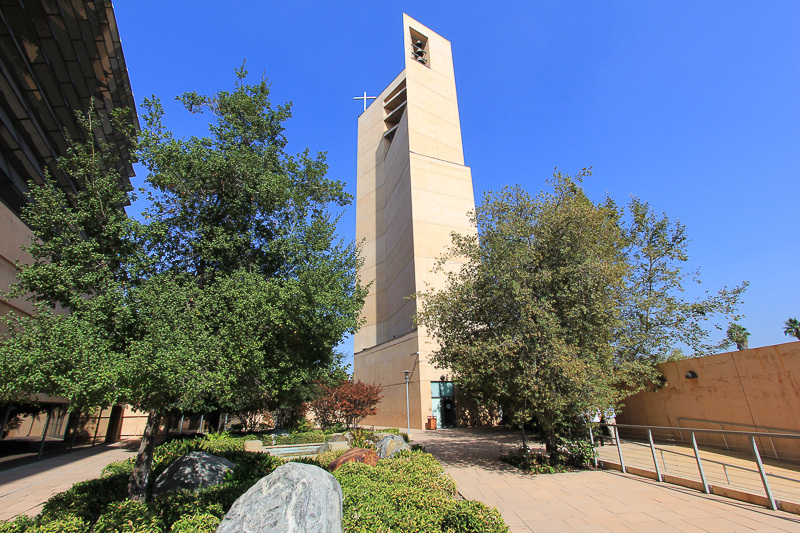 This is the Meditation Garden with the 156 foot campanile in the background. After all of that beauty, it was time to eat, so we headed off to Alhambra for two food stops. 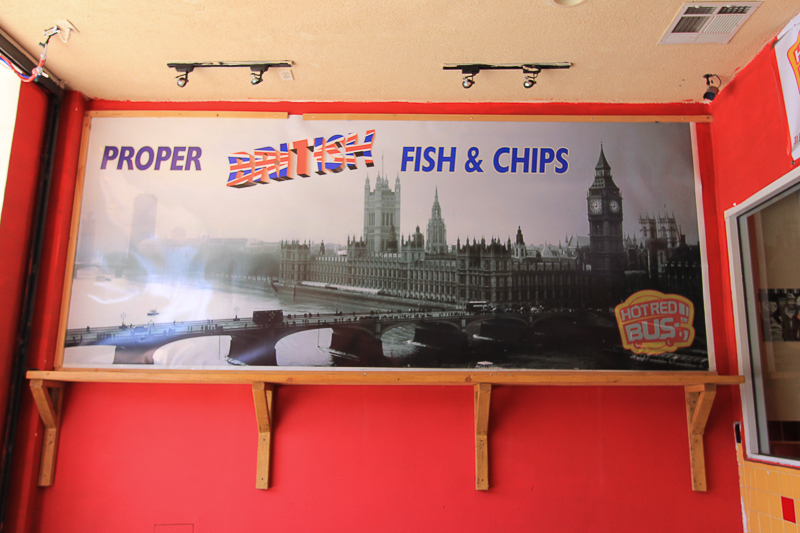 Lunch was at the Hot Red Bus, which serves authentic British fish & chips, which were delicious! 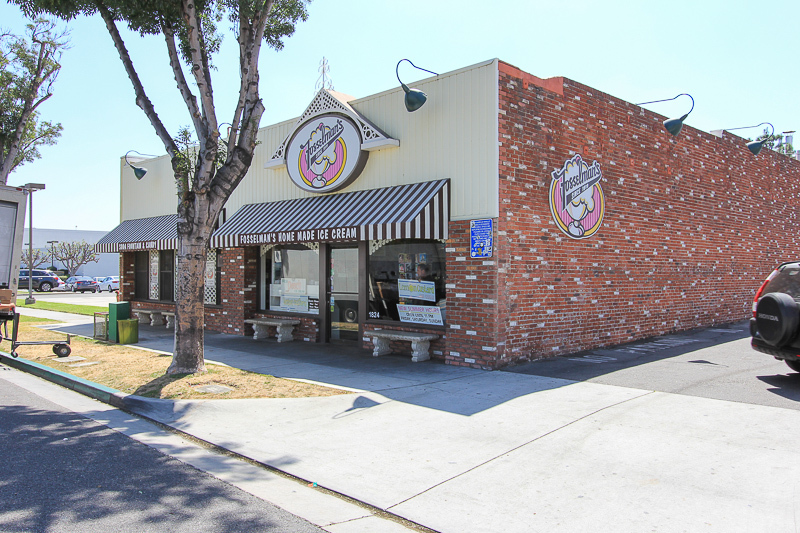 Then we were off to Fosselman's Ice Cream for dessert. Home made since 1919, they must be doing something right. Judy had the English toffee and I had their fresh peach ice cream, and I do mean fresh!